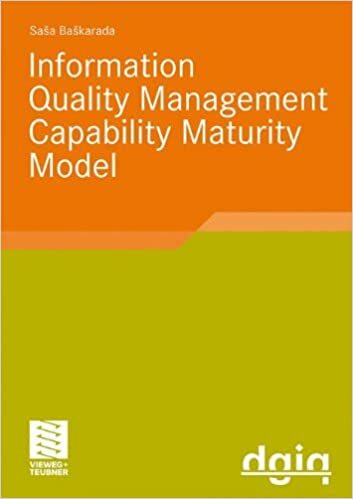 "IQM-﻿﻿CMM﻿﻿: Information Quality Management Capability Maturity Model" by Saša Baškarada has been published by the German Association for Information and Data Quality. Dr. Baškarada has an extensive background in the field of information and data quality so I recently caught up with him to find out more about his goals for the book and how he feels it will benefit organisations on their information quality journey. Data Quality Pro: Please describe your background. How did you get involved in information quality and what is your involvement in the sector at present? Saša Baškarada: My background is in academia, research, and software engineering. I taught a wide range of software engineering and computer science courses at the University of South Australia (UniSA) and I also spent some time developing software for the Defence Science and Technology Organisation (DSTO) before I got involved in information quality through my doctoral research. I completed my PhD at the Strategic Information Management (SIM) Laboratory at UniSA, while also researching data quality for a large Australian Defence organisation. I am currently working for PricewaterhouseCoopers (PWC) in Melbourne, where I am part of the Risk and Controls Solutions group. Through my current position, I mainly provide consulting services in the areas of data management, data quality, and data analytics. Data Quality Pro: What was your goal for creating the book? Saša Baškarada: My PhD research, which focused on the development of an information quality management capability maturity model, received positive feedback from researchers and practitioners alike. In particular, the German Association for Information and Data Quality (DGIQ) showed great interest in my work and offered to sponsor the publication of the book. I saw this as a great opportunity to share my findings with the wider data quality community and to invite others to provide feedback and actively contribute toward further enhancements of the model. Data Quality Pro: Can you explain the approach you took in developing the maturity model? Saša Baškarada: The Information Quality Management Capability Maturity Model was developed in three stages. Stage one involved six exploratory case studies and a comprehensive literature review. The aim of the first stage was to identify a wide range of candidate information quality management maturity indicators. Stage two involved a Delphi study with information quality experts (practitioners and researchers), which was used to validate and group the candidate maturity indicators into staged evolutionary levels. The final stage, stage three, was aimed at ensuring further external validation and enhancements though the application of the model in seven international case studies. Data Quality Pro: What type of reader do you feel this book is aimed at? Who would typically be tasked with implementing your approach? Saša Baškarada: The Information Quality Management Capability Maturity Model addresses technological, organisational/process, as well as social/people aspects of information quality management. As a result, this book should be of benefit to anyone with a strategic view of implementing a sustainable information quality management program in their organisation. More specifically, data/information architects, data/information quality analysts/managers, as well as data/information governance managers should greatly benefit from the approaches described in the book. Data Quality Pro: What benefits will organisations obtain through their use of the Information Quality Management Capability Maturity Model? Saša Baškarada: There are many reasons why organisations may wish to assess and enhance their capability maturity in information quality management, including minimising the costs associated with poor information quality and complying with government regulations and reporting requirements. The Information Quality Management Capability Maturity Model presents a set of evaluation tools, which are intended to assist with the identification of problems in the collection/storage/use of information and other information management practices. Furthermore, this tool is aimed at providing organisations with a measure of their capability maturity in information quality management, along with recommendations for increasing the level of their maturity, leading to enhancements in information quality. Thus, the model should help organisations with assessing their existing information quality management practices, developing improvement strategies, and benchmarking against best practice approaches as well as other organisations. Data Quality Pro: You raised an interesting point in the last question regarding "…benchmarking against best practice approaches as well as other organisations…”, this strikes me as very progressive but quite hard to implement – do you have any thoughts on how this can be achieved? Saša Baškarada: You are right in what you are saying Dylan – benchmarking tools and processes are definitely challenging to develop and implement. Firstly, I would like to clarify that IQM-CMM does not aim to benchmark the quality of data between organisations, but the maturity of data management and data quality management processes. My goal with IQM-CMM has been to identify, develop, and document a set of ‘best practice’ approaches for information quality management. Thus, organisations can use IQM-CMM to assess their existing processes against the best practices specified by the model. Benchmarking against other organisations could be somewhat more difficult to achieve, since not all organisations may be willing to openly share the finding of their assessments. However, this hurdle could be overcome through the use of independent IQM-CMM auditors, who could anonymise any findings (like I did in my book) before sharing benchmarking information with any potential competitors. Data Quality Pro: In the analysis you have undertaken so far, what were some of the common areas for improvement you have witnessed? Saša Baškarada: The potential areas for improvement will of course depend on the maturity of the organisation with respect to information quality management. For instance, less mature organisations may enhance data quality simply by standardising and consistently enforcing their access control and change management processes. Gaps in access control may lead to fraud, vandalism, and lack of ownership and responsibility. Similarly, system or process changes, if not managed appropriately, may lead to issues with data consistency and completeness. On the other hand, more mature organisations may benefit form standardising and documenting their enterprise information architecture as well as from taking a risk based approach to information quality management. Needles to say, raising data quality awareness through appropriate training usually leads to quick and noticeable improvements in most organisations. Data Quality Pro: What has the feedback been so far from organisations that have used IQM-CMM? Saša Baškarada: The feedback has generally been very positive. Information quality management professionals seem to value IQM-CMM for its broadness and the detailed practical guidance it provides. Furthermore, organisations do not necessarily have to perform a complete IQM-CMM assessment in order to realise benefits – just reading through the model may help data quality professionals identify or generate new ideas. Data Quality Pro: Do you find that organisations are generally surprised by the maturity rating they receive, either positively or negatively? Saša Baškarada: That’s a very interesting question. I have noticed that organisations which are ignorant about information quality generally tend to overestimate the effectiveness of their processes. I guess their lack of understanding leads to the lack of awareness. On the other hand, more mature organisations tend to have a much better understanding of their information quality issues and thus they may often be much more self-critical. Data Quality Pro: You mentioned your academic background with IQM, do you feel as an industry we should be doing more to promote the academic research into data/information quality? I sometimes feel that a lot of the great work carried out in academic circles rarely filters into the commercial world – what are your views? Saša Baškarada: I definitely believe that closer cooperation between researchers and practitioners would lead to greater benefits for everyone. For instance, many doctoral researchers are eager to identify and develop new and better approaches, theories, and models; however, many such researchers also struggle to get access to real-world case studies. One of the reasons for the lack of integration between practitioners and researchers may be due to the fact that much of the research tends to be quite specialised and thus not always easy to understand. Luckily, there are now quite a few groups/forums – such as Data Quality Pro, DGIQ, and IAIDQ – where practitioners and researchers can come together to establish networks and share ideas. If you are interested in adopting or developing the maturity model and wish to contact Saša Baškarada then please contact us at editor@dataqualitypro.com and we will forward on your details. Dr. Saša (Sasha) Baškarada has more than ten years of experience in ICT, having spent time in academia/research (UniSA) and the Defence Science and Technology Organisation (DSTO). Saša is a seasoned researcher, academic, and IT professional. He has exhibited thought leadership through the publication of one book as well as numerous book chapters and peer reviewed journal and conference papers. Saša has been teaching IT at the tertiary level for more than a decade, and has provided consulting advice to numerous public and private organisations in the areas of Information Quality Management and Strategic Information Management. His solid background in research and IT, coupled with his problem-solving and communication skills, enables him to deliver value from a scientific, educational, as well as a business-oriented perspective. Furthermore, his professional manner and ability to establish a close rapport with his clients and students allow him to constantly exceed expectations.